Located in Sec. 15Twp 21N Range 38 EWM. 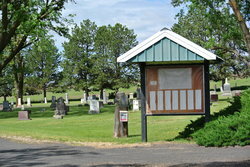 next to Lakeside cemetery on Macabee Road near Sprague, Wash. some 1 1/2 miles northeast of town. Earliest date of birth on a stone was1820 and earliest date ofdeath 1886.